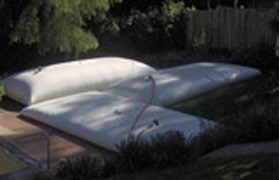 FAQ: Do you supply pillow tanks overseas? I would like to get two 10,000 liter pillow tanks to my location. I need to know if this is possible. The location that I am in is Zambia. Are you able to help? Thank you for contacting us! In order to receive two of these 1000 gallon Pillow Tanks in your location, the first thing we would need to do is get you a price quote and shipping options. We can ship our collapsible tanks worldwide, including locations such Zambia. Questions? Give us a call at +1-772-646-0597 or fill out our quote request form to discuss your collapsible tank requirements. Type of Liquid Being Stored: When pricing these collapsible tanks, fabric options chosen for the tanks will depend largely on your location and the type of liquid being stored. For example, customers looking for drinking water storage will require an inner liner that is NSF 61 and FDA approved for safe drinking water storage. Location Requirements: In addition, it can also be helpful to know if you have any location storage requirements. This can include high or low temperatures, duration needed for storage and liquid temperature the tank may need to accommodate. Fitting Requirements: Please also let us know if there's any specific fittings or requirements you need for you tank. Our standard fittings range in size from 3/4" thru 2" with optional sizes ranging from 4" to 6". Fitting materials used are aluminum, stainless steel, and polypropylene with camlock, storz, or threaded fittings to accommodate hoses. Ball valves, pressure relief vents, and caps are also available.